1. Any period for which there is no documentary evidence and the study of cultures before written history or of more recent cultures lacking formal historical records. 2. In a strict sense, "history" is an account of the past recovered from written records, but such an account can be prepared from other sources, notably archaeology. 3. The term prehistory was coined by Daniel Wilson in 1851 to cover the story of man's development before the appearance of writing. 4. It is succeeded by protohistory, the period for which we have some records but must still rely largely on archaeological evidence to give us a coherent account. 5. Prehistory differs from history in dealing with the activities of a society or culture, not of the individual; it is restricted to the material evidence that has survived. A glandular secretory product, having little or no inherent biological potency, that is converted peripherally to an active hormone. To drink before or previously. To form an opinion about something or someone before there is sufficient understanding or knowledge: There were those who complained that certain reporters had prejudged the results of the election. A preconceived idea or opinion that has been held before the facts are known: Practices that exclude people of certain races, religions, or nationalities from jobs, schools, or housing are based on the worst kind of prejudices. Preceding the establishment of milk flow; a term applied to the feeding of a newborn baby with carbohydrate-electrolyte solutions to reduce initial weight loss until breast feeding is fully established. 1. Coming before the main or most important part of something. 2. Something that precedes, prepares for, or introduces the main matter, action, or business. 3. An academic test or examination that is preparatory to one that is longer, more complex, or more important. 4. In sports, a contest to determine the finalists in a competition. 5. A sports event that precedes the main event of a particular program, especially in boxing or wrestling. Occurring before the development of language. 1. A preliminary performance or activity that takes place before introducing one of more importance; a preface to a literary work: Douglas, the author, asked a fellow writer if he would write the prelude to Mildred's new book. 2. In music, a piece that is performed before the introduction to a musical presentation; especially, such a movement preceding a fugue or forming the first piece of a suite: Johann Sebastian Bach wrote some of the most beautiful preludes Brian had ever heard. When Tracy went to the opera, she had just a minute or two to read the program before the orchestra played the prelude. The performance by the school choir was the prelude to the president of the school board's speech on music in the schools. 3. Etymology: from Middle French prélude, "notes sung" or "played to test a voice or instrument" (1532); from Middle Latin preludium, "prelude, preliminary"; from Latin præludere, "to play beforehand for practice, to preface"; from præ-, "before" + ludere, "to play". 1. To act as an introduction to an event; especially, that which is longer and more important: The dark clouds are preluding a severe storm. A good education and proper training are preluding Jim to a good career. 2. To come before; often, to introduce a piece of music before a bigger composition: The pianist preluded Wilhelm Richard Wagner's opera with a short Frédéric François Chopin presentation. 3. 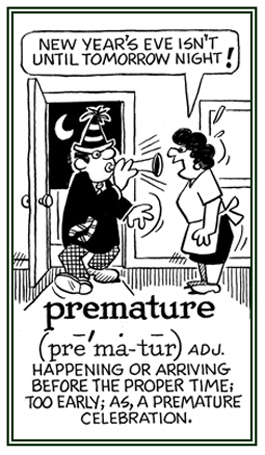 Etymology: from Latin praeludere, "to play before"; from pre-,"before" + ludere, "to play". An introduction which indicates that something of a similar kind is to follow: Mrs. Dean, the principal of the high school, gave a prelusive speech at the graduation ceremony during which she talked about the achievements of the students. 1. A reference to something that happens before the proper time: When the candidate for mayor was about to announce his victory, he was told that he was making a premature statement because all of the ballots or votes had not been counted yet. 2. Descriptive of anything that is occurring, growing, or existing before a customary, correct, or assigned time: Jerry missed his flight because it made a premature departure in order to avoid the severe storm that was approaching the area. 3. Etymology: from Latin praematurus; from prae-, "before" + maturus, "ripe." © ALL rights are reserved. Showing page 10 out of 19 pages of 275 main-word entries or main-word-entry groups.